We Got To Spend A Night Glamping Under The Stars At An Actual Theme Park! Glamping is probably one word that you might have come across recently. Though its not a new trend per se, it’s definitely on the rise, especially for locals who are being more selective with their mode of accommodation these days. For those who are uninitiated, it is basically camping done luxuriously. 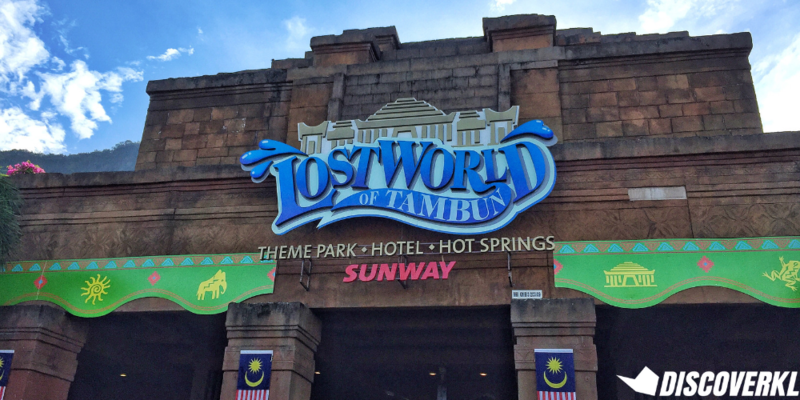 We got to experience that first hand at Sunway Lost World Of Tambun and our glamp tent was big enough to fit actual queen-sized beds and other furniture. 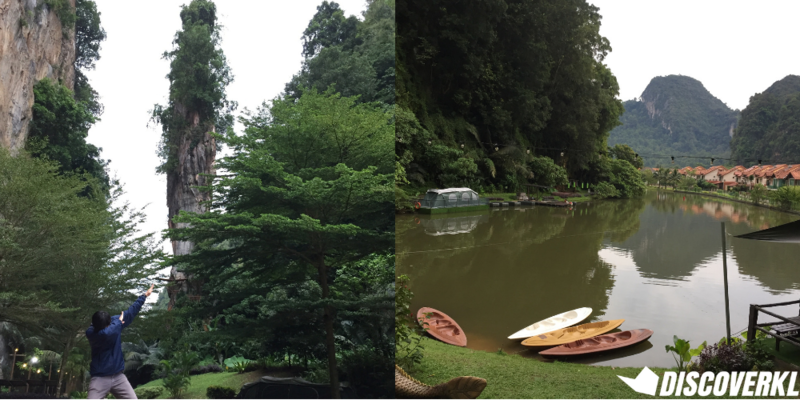 A hidden gem within Malaysia, Sunway Lost World of Tambun allow its guests to camp without the discomforts of being outdoors. 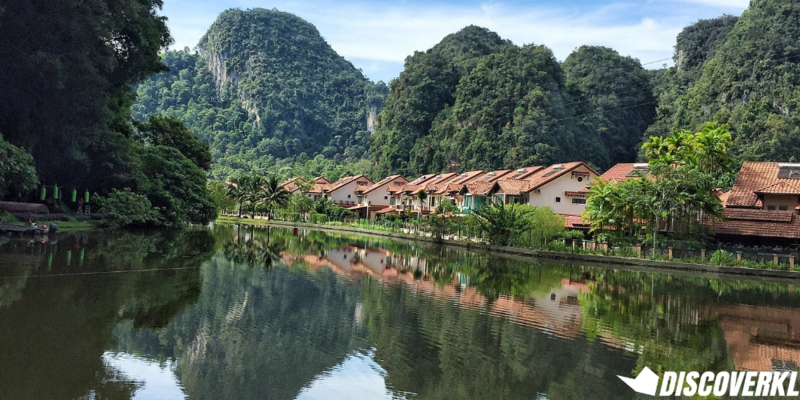 With a stunning backdrop of limestone rocks and other natural rock formations, this is not one to miss. If you have a friend or two who are down to camp in style, this could be one to consider for your bucket list. Our hosts, Bella and Firdaus, escorted us to a glam tent as soon as we arrived. 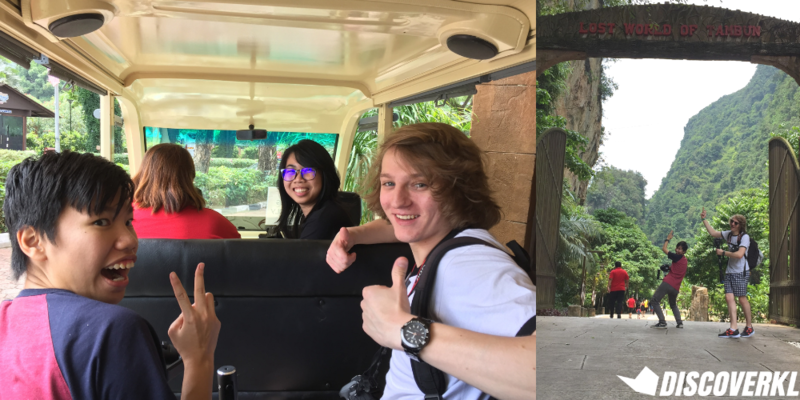 We rode a private buggy to the accommodation area and from the viewpoint of the buggy, we got to marvel at the beauty of nature. The park gave us major Jurassic Park feels and we were stoked to see what’s next. 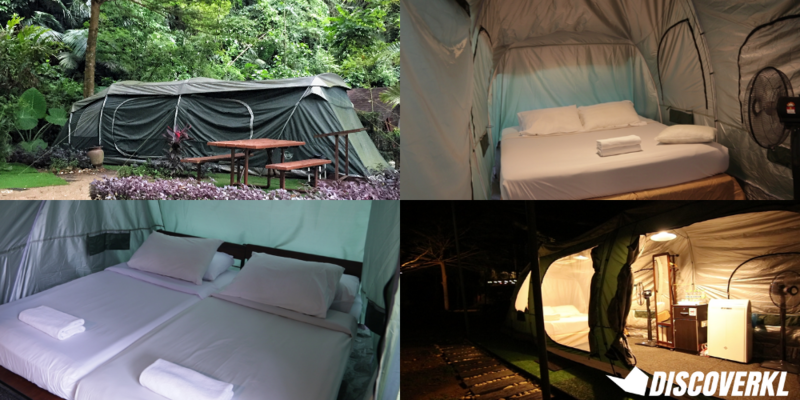 The glamping area is situated at one end of the theme park (at the Adventure Park) and is conveniently quite a distance away from all the noise and commotion. Thank goodness for the buggy because I would imagine it to be quite a distance on foot. As soon as we arrived, the breathtaking lush greenery is what took our breath away and without a question, this beats any view from a hotel window. Of all the limestone formations, The “Pencil Rock” pinnacle in all its majesty was the one that got us ooh-ing and aah-ing. Once we checked in, the receptionist handed us 2 sets of padlocks so we could lock up our tent whenever we are not in it. We were initially worried about leaving our personal belongings behind but were assured that it’s quite safe to do so. This gave us a peace of mind as we could head to the theme park and leave our laptops and mobile devices behind. There are also plenty of rangers patrolling the area to ensure the guests’ safety. That being said, we wouldn’t advise leaving the tent unzipped during the night (even with the spectacular view of lit fairy lights and the calm blue lake outdoors) as there might be mosquitoes lurking around the area, what with the glamping area being situated right next to a lake. Tip: Bring along a mosquito repellent just in case. We did not get bitten (thankfully!) but it’s better to be safe than sorry. As we explored what other facilities the tent had to offer, we found 2 stand fans that would be useful if you’re planning to take naps during the day. There were also electrical points within the tent that allowed us to charge our phone and camera batteries. When we were there, we could listen to the sound of crickets throughout the night but that did not disturb our night’s rest as it also drizzled slightly, making it the perfect environment to sleep in. There’s a shower room and toilet located just 1-2 minutes away from the glamping site and we were pleased to find that basic toiletries are provided, and this includes shampoo and shower gel. Each cubicle came with a built-in heater and there’s nothing quite like a warm shower after a full day at the park, sweating while we waited in queues and getting drenched, what with the unpredictable Malaysian weather. Hair dryers are provided as well. The next morning, we woke up to sound of monkeys chattering away. We were pre-warned that there are wild monkeys on the campsite but we certainly did not expect what’s to come. The monkeys had approached our campsite and being the curious creatures that they are, one of them went through our toiletry bags (which we placed outside of our tent) and stole our toothpaste. Thank goodness we had back up! You’d find these monkeys while en route to the shower room. Don’t worry though. As the saying goes, “if you don’t kacau them, they won’t kacau you”. After freshening up, the buggy service took us to the Garden Terrace for breakfast. 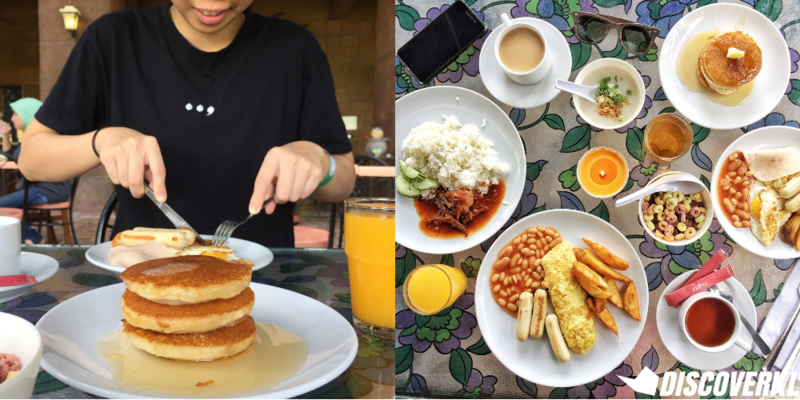 We enjoyed a buffet breakfast privilege which is included in the glamping package. Meals ranged from local delights to Western cuisine. And trust me, we went full on with breakfast as it was pretty good. After a sumptuous and filling breakfast, we went on to enjoy the theme park for the rest of the day (theme park tickets are also included in the glamping package). 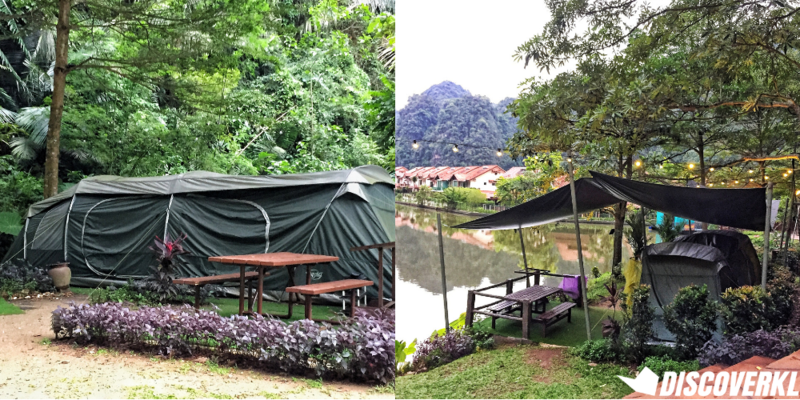 If you’re looking to experience glamping at Sunway Lost World Of Tambun, do note that prices for 4 pax (2 adults and 2 children) is set at RM588 and it is inclusive of a tent with beds and the facilities for 2 days 1 night. Buffet breakfast will be provided for 4 pax at the Garden Terrace as well and it’s also inclusive of Theme Park Entrance for 4 persons for 2 days (worth RM452). Alternatively, for 2 pax (2 adults), the cost is RM438 with an option to add-on for a 3rd person (child RM105, adult RM120).